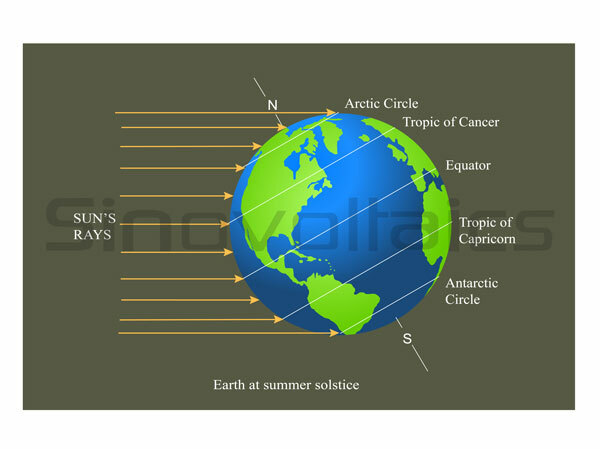 Here we give an introduction to physics of solar radiation and solar insolation. The complete concept of harnessing solar energy to generate electricity is based upon the phenomenon of solar radiation. It is this radiation from the sun, together with a few more factors, which is the reason why life exists on earth. Solar radiation is electromagnetic in nature and is the radiant energy emitted from the sun. The total frequency spectrum of this electromagnetic solar radiation covers visible light and near visible radiation (UV Rays, Infrared Rays, X-Rays, etc.). The visible light and heat supports life on earth while much of the near visible harmful radiation is deflected away by the earth’s atmosphere. Sun produces its energy by the, never-stopping, nuclear fusion reaction, which converts approximately 700 million tons of hydrogen to helium per second. This process creates massive amounts of heat and it is due to this heat that photons are emitted. Each emitted photon travels a very short distance before being absorbed by another molecule, which by a similar process, emits another photon. This process of absorption and re-emission continues and the photons keep moving forward, finally being able to reach the outer space at the sun’s surface. What is Direct Normal Irradiance (DNI)? Direct Normal Irradiance (DNI) is the amount of solar radiation received per unit area by a given surface that is always held perpendicular to the incoming rays. The amount of irradiance can be maximized by keeping the receiving and electricity-generating surface – the PV module – on optimal track with the movement of the sun and thus of the sun rays. The journey from sun’s core to sun’s surface typically takes around 100,000 years. When in the outer space, the photon is radiated and incepted by planets as light. This journey from the sun’s surface to the earth’s surface typically takes around eight minutes. The total energy emitted by the sun is 63,000,000 W/sq. m. The intensity of solar radiation striking the earth is determined by the Inverse Square Law. This means that the total radiant energy striking the earth’s surface is inversely proportional to the square of the distance. For double the distance, this energy reduces to a quarter of the original energy. Only about 40% of the solar energy which is intercepted by the earth is passed through the atmosphere and is available for solar applications. During the process of nuclear fusion, the sun produces energy that in form of electronicmagnetic waves (radiation). 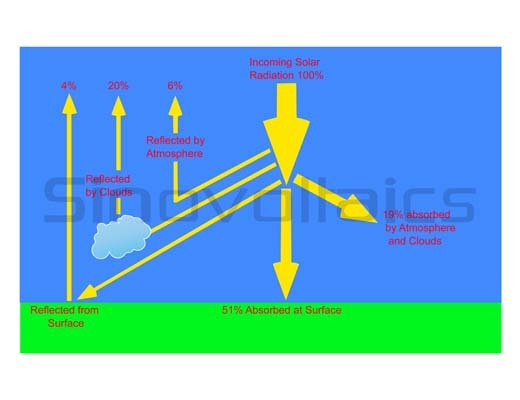 Solar insolation is affected by factors such as atmosphere, angle of the sun and distance. The thinner the atmosphere in which the sun is passing through, the more the insolation. Insolation is also at its highest when the sun is directly overhead in an area. This is also the shortest distance between the sun and an area. When the angle of the sun to an area increases, the distance increases, and a lot of energy is lost through reflection. Insolation refers to the quantity of solar radition energy received on a surface of size X m² during an amount of time T.
In the photovoltaic industry it is commonly expressed as average irradiance in kilowatt per square meter (kW/ m²) or – taking into account the time factor – kilowatt hours per year per kilowatt peak kWh/(kWp*year). A solar insolation map is a chart showing the average daily hours of solar insolation in an area. World insolation maps show the amount of solar insolation in a given area at a given time. An example of an insolation map can be seen below. As can be seen from the map, insolation is highest in equatorial regions where the sun is more likely to be overhead, and lowest in Polar Regions where the angle of the sun to the earth is greatest. Insolation maps are commonly used in solar system design. Solar system designers use insolation data values to determine the solar system design in an area. The insolation of an area determines how much energy a square foot of solar panel can provide on any given day. When the insolation rate in an area is low, more square-footage of panel is required to maximize energy output. Insolation maps enable solar system designers to estimate the realistic output of a PV system by taking into account the insolation of a particular area. The total solar irradiance upon earth (TSI) amounts to 1.361 kW/ m², which in theory on earth with a surface area of about 510 million square kilometers totals to 694.11 terawatt. 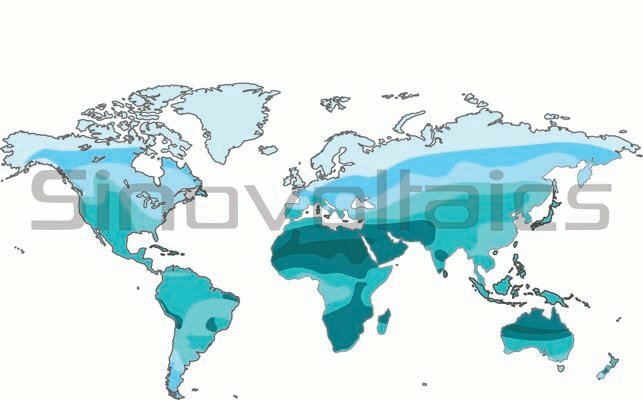 Particularly the southern hemisphere and desert areas have a large potential for solar-generated electricity, see solar insolation world map above. Thank you Google who is giving us knowledge about every thing hats up to you. Please can I get the mathematical relation between the Solar Radiation and solar Insolation. Isn’t the conversion of Hydrogen into Helium nuclear “fusion”?